The day couldn't have been better. When Harvey picked me up at 6 AM, we could already tell that it was going to be an uncharacteristically gorgeous day for August. Cool temps and bright sunshine were already apparent. We also knew that we would have a fun day because we were going to meet our friend Marc at the lighthouse. Marc is one of those guys who makes the best of every day and makes the people that he is with feel the same way. He has limited time to bird these days due to other commitments but wanted to spend a few hours around Cape May Point for shorebirds and terns. We arrived to find Marc on the Hawkwatch platform scanning for terns, ducks and waders in Bunker Pond. 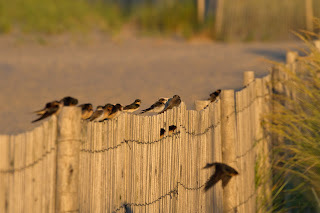 After hugs and kisses, we headed to the beach to scan for terns but were surprised to find swallows swarming the beach and sitting on the sand and on the beach fence. Harvey and Marc found 2 Bank Swallows in the midst of the hundred or so Barn Swallows. 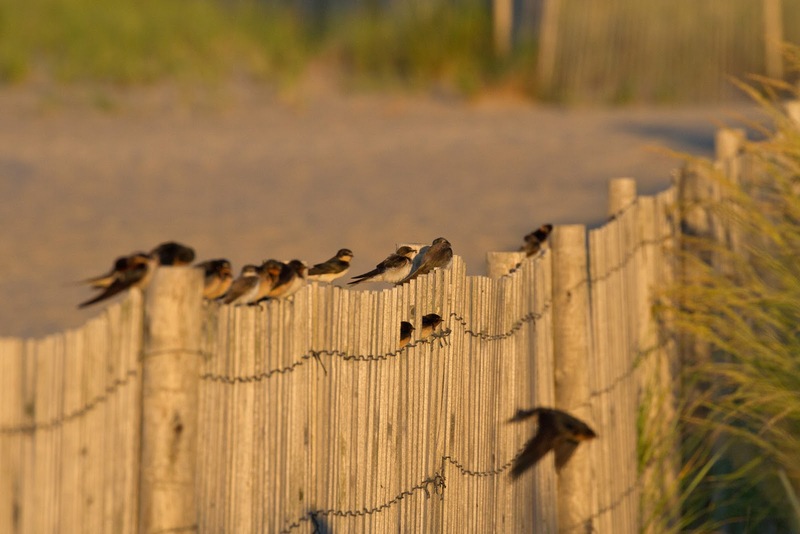 We headed down the path behind the dunes to see if we could find other interesting birds. There are several ponds along this path which are referred to as "Plover Ponds". 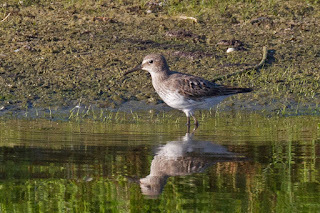 Shorebirds are often seen here and we were not disappointed. 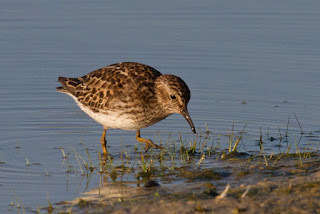 For those of you who find shorebirds boring, I invite you to go here for close up views of these birds. Here, you can see the beauty of the plumage, and the behavior that can help you identify the species and even the age of the birds that often look the same at long distances. For instance, this Least Sandpiper often looks like a little dirty brown bird but here, I got so close that you can see the yellow legs and streaking on the throat. Least sandpipers are tiny, so they are often found at the water's edge or in the mud rather than in the water. 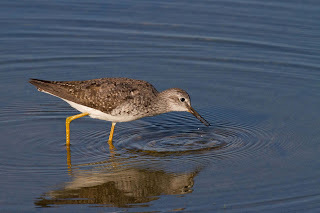 And here, you can see the Lesser Yellowlegs in typical foraging pose. 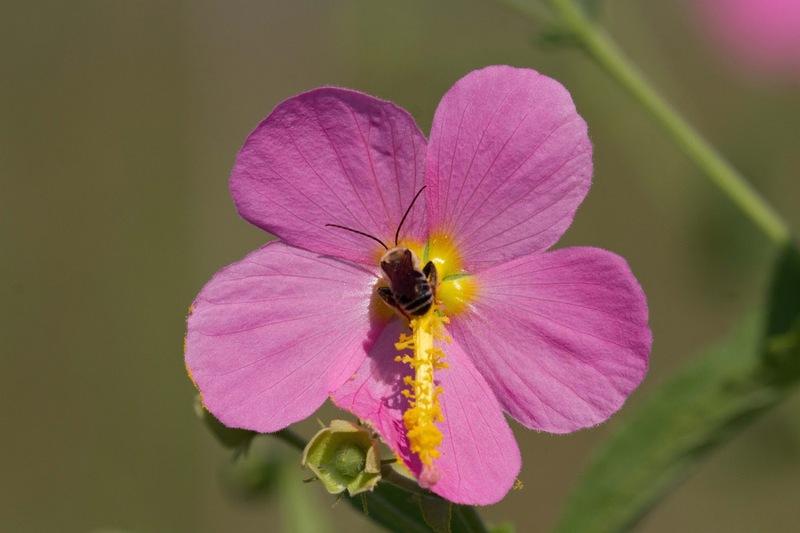 They poke at the water's surface for bugs and other critters, often chasing them around. 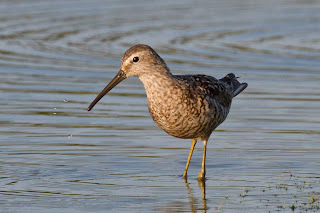 This Short-billed Dowitcher ( I know, the bill isn't that short ) is a juvenile wearing his/her first adult feathers. 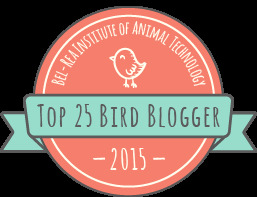 You can tell because the feathers are perfect - they aren't worn out, dull, or frayed. 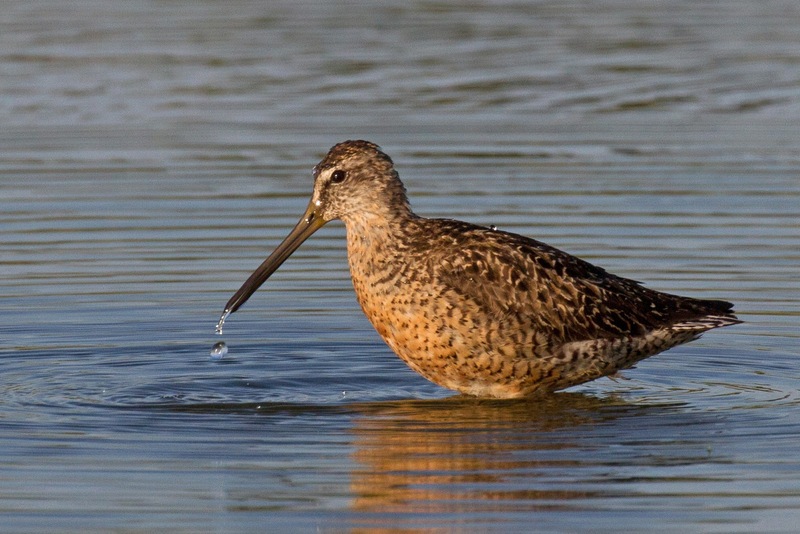 Dowitchers are often called "sewing machines" because they are constantly poking that bill under water feeling around for food. It really does look like a sewing machine. I caught this bird in mid stitch. 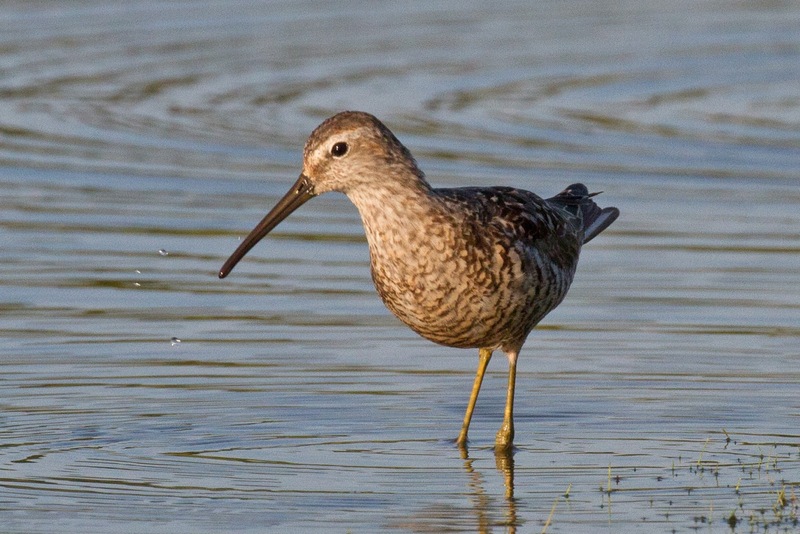 A highlight of any shorebird trip is seeing a Stilt Sandpiper. 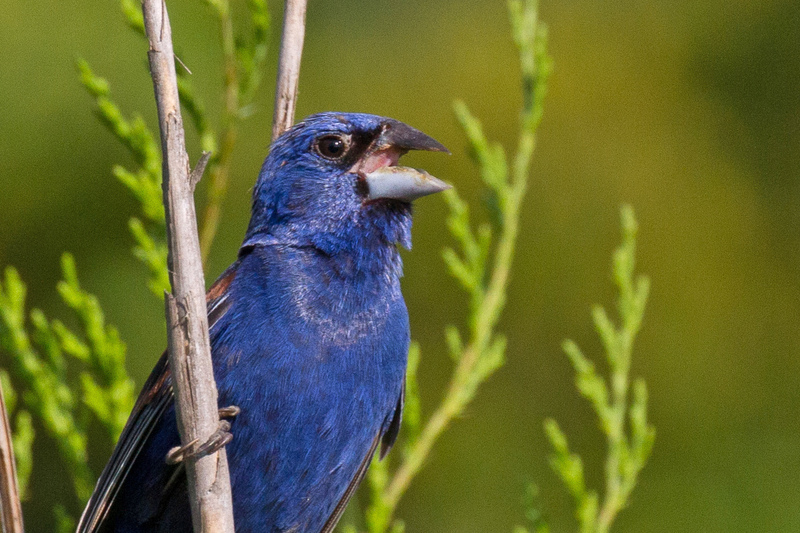 This bird has a droopy bill and beautiful barred breast which can be seen in this photo. They use the same poking motion as the Dowitcher but can get into deeper water since they have longer legs. In fact, they often dunk their entire head underwater searching for food. Another bird on our target list was this White-rumped Sandpiper. These birds are difficult to identify until they fly and reveal their white rump (hence the name). This bird was on the other side of the pond so the photo isn't as good as the others. Marc noticed the bird and started to notice the long wings, slender build and lighter color of the bird. 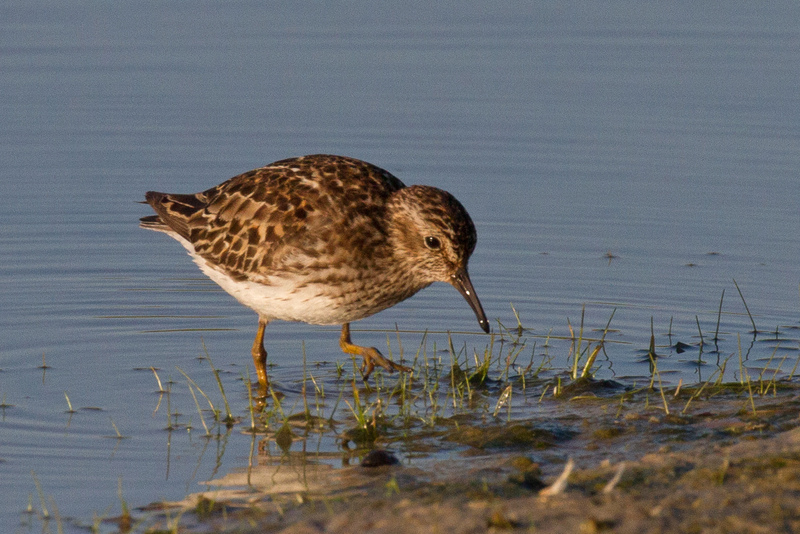 These field marks can also be used to separate this species from more common Semi-palmated Sandpipers and other "peeps". The bird eventually flew along the bank to reveal the white rump. If they day ended here, it would have been extraordinary but it didn't end. We kept walking the trail which turns away from the ponds and heads back to the lighthouse. 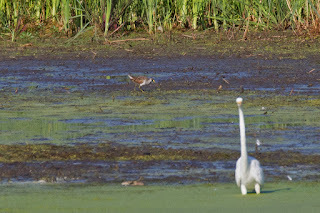 The trail takes you through woods and marshes where we found a variety of other birds including an elusive Sora. Marc spotted it as we were scanning through the herons and egrets in the marsh. 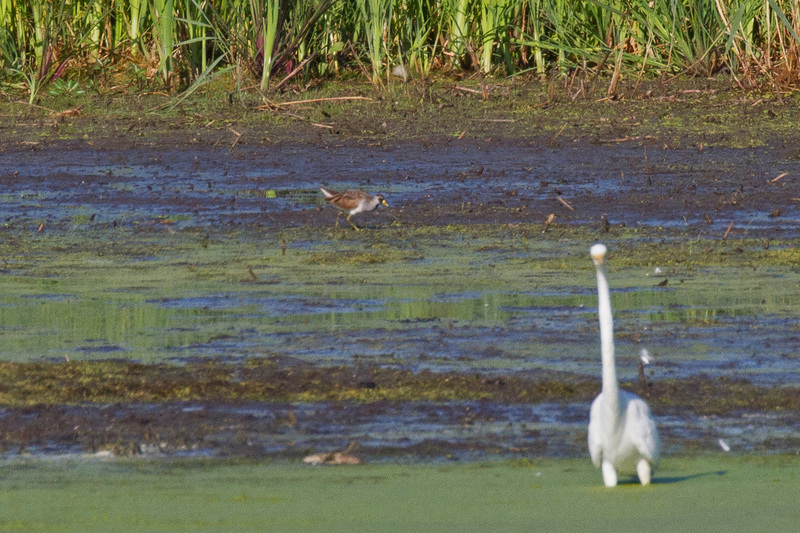 Its the little brown and gray bird behind the Egret in this photo. We saw many more common birds along the trail. For some reason, they were more photogenic today. I swear Marc's charma has something to do with it. Take for instance, these 2 blue birds. They are both common birds in the area but I have never been so close or had the opportunity to get photographs like this before. 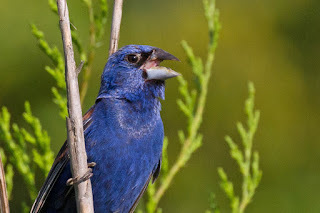 The first bird is Blue Grosbeak. He sat there singing his little heart out while the 3 of us walked up the trail. 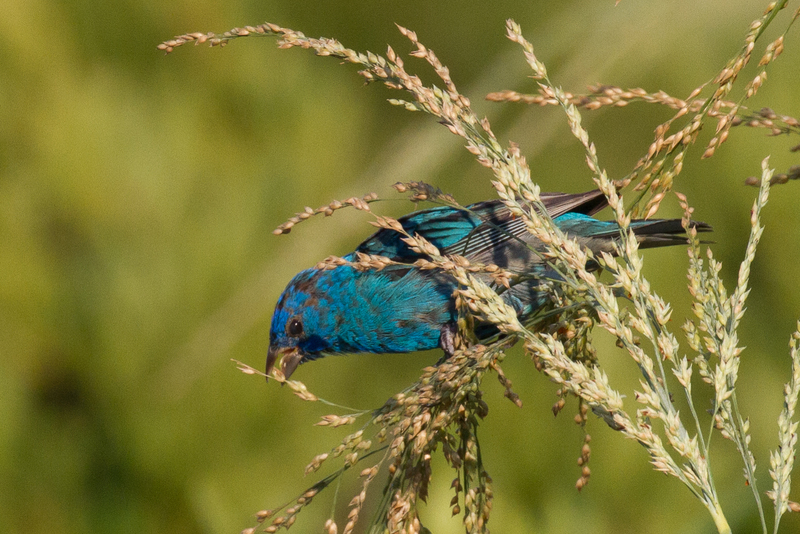 Here is Indigo Bunting eating seeds of dune grass along the beach. I have never seen a bunting along the beach but there he was picking at seeds while we stood a few feet away snapping photos. This bird is still getting his adult feathers. You can see some brown/gray feathers dotting the blue. The sunlight was so nice that it almost made this bird sparkle. Finally, as we were nearing the end of our trip, Harvey noticed this beautiful pink flower along the boardwalk. A bee landed while I was taking a photograph. 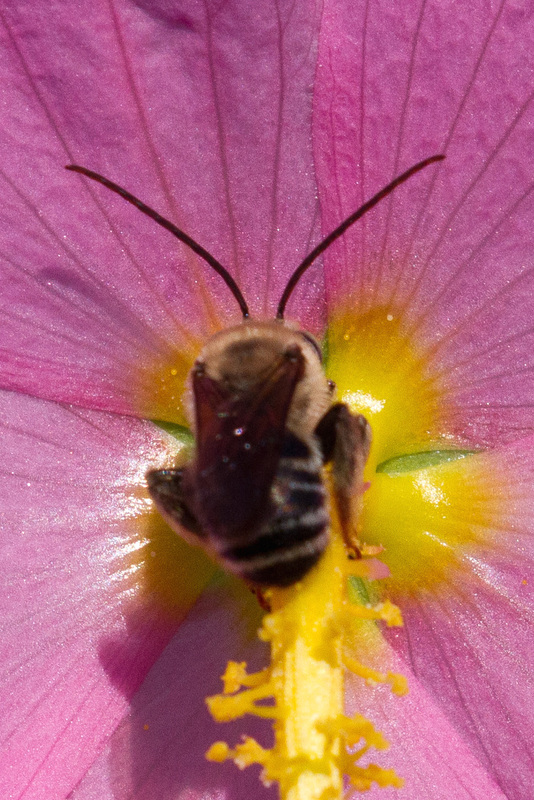 My new camera lens allows me to get pretty close to the flowers and bugs. Harvey is envious. We had a great day and ended up with 82 species of birds - all before 11 AM. Marc headed north to meet family in Ocean City. Harvey and I headed back home to do chores. Hugs and kisses? Hugs and kisses. And all I get is an occasional HH? Harumph!!! Other than that, a great post.